How can analytics scholars and healthcare professionals access the most exciting and important healthcare topics and tools for the 21st century? Editors Tinglong Dai and Sridhar Tayur, aided by a team of internationally acclaimed experts, have curated this timely volume to help newcomers and seasoned researchers alike to rapidly comprehend a diverse set of thrusts and tools in this rapidly growing cross-disciplinary field. The Handbook covers a wide range of macro-, meso- and micro-level thrusts such as market design, competing interests, global health, precision medicine, residential care and concierge medicine, among others and structures what has been a highly fragmented research area into a coherent scientific discipline. The handbook also provides an easy-to-comprehend introduction to five essential research tools Markov decision process, game theory and information economics, queueing games, econometric methods, and data analytics by illustrating their uses and applicability on examples from diverse healthcare settings, thus connecting tools with thrusts. 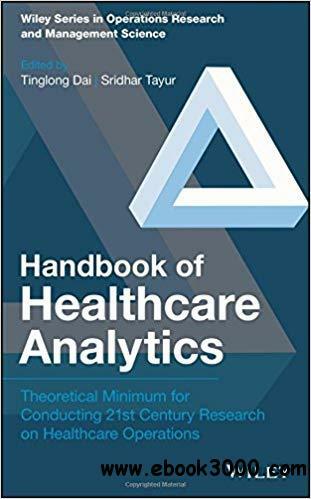 The primary audience of the Handbook includes analytics scholars interested in healthcare and healthcare practitioners interested in analytics. This Handbook: - Instills analytics scholars with a way of thinking that incorporates behavioral, incentive, and policy considerations in various healthcare settings. This change in perspective a shift in gaze away from narrow, local and one-off operational improvement efforts that do not replicate, scale or remain sustainable can lead to new knowledge and innovative solutions that healthcare has been seeking so desperately. - Facilitates collaboration between healthcare experts and analytics scholar to frame and tackle their pressing concerns through appropriate modern mathematical tools designed for this very purpose. The handbook is designed to be accessible to the independent reader, and it may be used in a variety of settings, from a short lecture series on specific topics to a semester-long course.